Do you remember the day someone told you the earth was actually round? I do, and I remember it was the stupidest thing I ever heard in my life. If it were round, we would fall off! The n that person tried to tell me that we were not on top of the ball! That was just plain silly. As a five year old, I had no way to conceive of how the earth could be round. Gravity was a concept that far beyond my understanding. Today is Trinity Sunday, and as we approach this subject many us may feel like I did when I was a five year old hearing about the shape of the earth. It makes no sense. God is three persons, but one God. The three persons are different, but all a part of the same God. In the movie Million Dollar Baby, the character Clint Eastwood plays likes to torment his priest by asking him questions that are incredibly difficult to answer and he loves asking about the Trinity. I think that was true then and is still true today. And that is no wonder. The doctrine of the Trinity is the most complicated religious doctrine I have ever encountered. And yet is it all but incomprehensible for even the most intelligent of theologians, much less for the average layperson. So why bother? 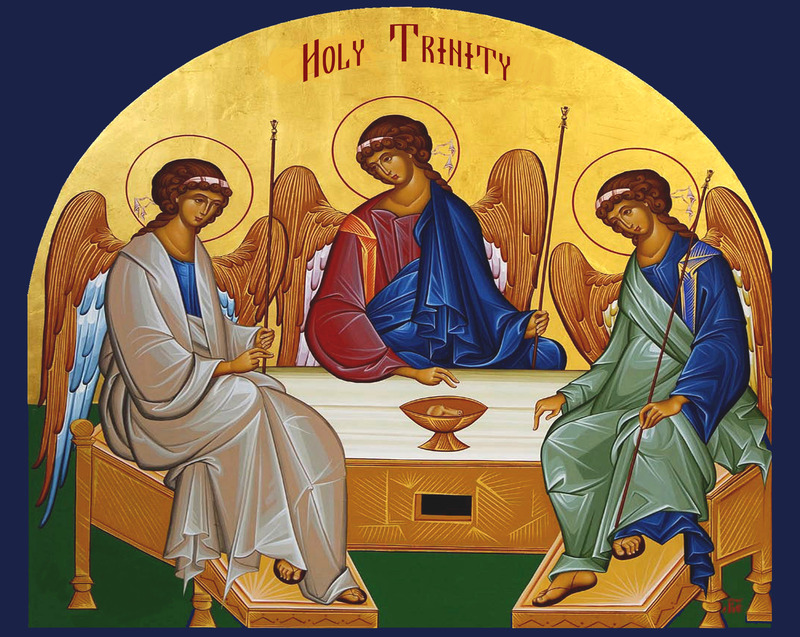 Why should we even have something called Trinity Sunday? If this thing is so cotton picking hard to understand, why don’t we just consign it to the dustbin of history, and be done with it. The greatest minds in the history of the Church, from Augustine to Thomas Aquinas delved into the Trinity, and none of them were able to fully understand or explain it, and what they DID understand was so involved that I could spend all morning trying to convey their insights, and in the end we would all just be more confused than when we started. Well, because there ARE some things we CAN say about the Trinity. And what we can say is pretty important to our life of faith. So what can we say about the Trinity. God is not a simple being, and wanting God to be simple does not make God simple. Think about this. How many people to you really understand? I have been married, and have children, and I cannot say I fully understand my wife or kids. They are complicated people. Truth be told, I don’t fully understand myself! I am a complicated person. How then can I possibly think I can fully understand God? Beware of people who want to make God a simple god. There is a major difference between having a simple faith in a complicated God, and having a lazy faith in a simple god. God is not simple. When we turn our creator, our redeemer, into a simple god are selling the Lord of the Universe and ourselves short. I have been a practicing follower of Jesus for the last 40 years and I have to admit that I know less about the Son of God than I know about my own children. The fact that the Trinity is a complicated idea does not prove it is true, but neither should we discard it because it is complicated. Life is full of complications, people who try to simplify everything end up never really understanding anything. The doctrine of the Trinity actually centers around the idea relationships, not doctrine. In essence, what the Trinity teaches us is that without relationships, God is not God. God is, by definition, a relationship between the persons of the Trinity, Father, Son, and Holy Spirit. Early in the history of the church, when they were developing the idea of the Trinity, they decided to refer to the three as “persons.” Now that word is not the Bible and they did not adopt is lightly. But they felt it was important. There are different ways to describe the Trinity. It is like a shamrock—three leaves, but one shamrock. Or an orange—peel, pulp and seed, all orange, but all different. Or the Trinity is like water—same substance, but it comes in three forms: liquid, ice and steam. Those are all good symbols for the Trinity but each is missing something very important—the personal element. God is not an impersonal force. God is a person…well, three persons! Now in the recent past, people have played with the language of the Trinity some. We know, for instance, that God does not have a specific gender. God is not male, and not female. In the book of Genesis, when people are being created, God says, “let us make them male in female, in our image.” Male and female, in our image. We can say that God is neither male nor female, or that God is both male and female. Or maybe even that God is perhaps beyond male and female. But we cannot say that God is either male or female. But we have this language of the Father, and the Son. When this language was developing, it made a lot sense. The words “father” and “son” meant certain things back then that they does not mean today. Back then, only a male could inherit a property. But Paul is really clear that we have an inheritance from God. All of us. In his world you had to be a son to inherit, so Jesus was the Son of God, and we are all Brother of Jesus. Fathers and Sons had legal rights that mothers and daughters did not have. Today things have changed radically. So maybe we can use a change in language. All language about God is symbolic. But there is one thing that is important about the language. In order to be a Father, or a Mother, you have to have an offspring, a son or a daughter. No offspring, no parent. The essence of God is a relationship between the Father, the Son and the Holy Spirit, and that relationship pulls us in. We are involved in that relationship. We come to the Father, through the Son, in the Spirit. Or another way to say it, we come to faith in the Source of All Being, through the work of our Savior, on a spiritual river of Living Water. The Trinity is not to be explained, it is to be known. When I lived in Germany, I made some common mistakes with the language. One of them was how we said “I know.” Someone would say something like, “Boy, that test was hard,” and I would reply, “Yeah, I know.” Well, what I said was, ‘Jah, ich weist” You see, in German there are two different words which mean “I know.” One is wissen. That refers to your knowledge of facts. You might say, “I know that Shakespeare wrote Macbeth,” or I know fifteen different Bible verses, or I know that Bill will not be at work today. It is not about knowing as much as we can about God, it is about knowing God. It is about loving God, and understanding that we are loved by God. It is about creating relationships on earth that mirror the relationship between Father, Son and Holy Spirit, relationships of love. In the end the Trinity is not to be understood or explained. Yes we can learn some things from it, but we can never understand it. In the end, the Trinity is to be loved and worshiped—the Father, the Son and the Holy Spirit.